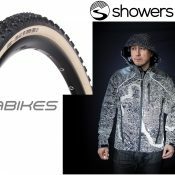 What do studded tires have to do with bike funding? N. Rosa Parks Way in Portland. With a lack of funding for transportation projects such a major issue in this town, it’s not surprising that some activists are taking a serious look at studded tires. Why? According to the Oregon Department of Transportation, studded tires cause an estimated $50-60 million a year in road damage and ODOT spends $11 million a year fixing it. And this isn’t just an activist speaking. ODOT themselves have worked the state legislator for years to curtail the use of studded tires (Oregon legalized studs in 1967) . But so far, statewide legislation that would tax or ban the use of studded tires has failed to gain much traction. Also in 2001, lawmakers proposed a yearly fee of $20 to use studded tires, punishable by a $150 if caught without a permit. But efforts to tax studded tires have been met with resistance by legislators east of the Cascades for the same reasons as outright bans. One possible solution could be bans and/or permit requirements enforced by cities or counties. I’ve asked Multnomah County Chair Ted Wheeler and Portland Mayor Sam Adams if they’d support that idea and I’ll update this story when I hear back from them. As for the connection to biking? Here’s how Bernards puts it: “I think if the bike community could get this passed saving local taxpayers millions, the public may be more inclined to support funding the Bike Master Plan.” Bernards is currently gathering support for his effort. One thing about being on a bike is that I notice how many cars are running on studs with their tell-tale crunching sound. Its amazing to hear so many cars on studs in Portland. There really is no excuse, if you want to live in the West Hills or on the buttes in Clackamas County use Spyder Spikes or something removable. When its sunny and 50 degrees in Portland, the last thing I want to hear are studs on the roadway. Support for a studded tire fee should be based entirely on the direct cost of fixing the resulting road damage. And rather than a permit (with resulting administrative overhead and enforcement), it should be a user fee on the purchase of studded tires, calculated to recoup the costs over the lifetime of the tires. That price hike would encourage people to use studless winter tires, which independent testers say are just as good on ice and much better on wet pavement than studs. If someone does want to link studded tires and bikes, I’d say we’d have to also propose a purchase fee on new bikes, with the proceeds dedicated to bike-related uses. I’m sure the bike lane marking would last longer without studded tires. Does anyone know if chains cause the same level of damage? Chains are damaging too, but they are used less frequently. @2 Andrew is spot on, that would be a politically dicey thing if it was a transfer from studs to bikes. But any new transportation funding should help maintain surfaces we share. Studded tires are SO AWFUL for our roads! It’s kind of like, brushing your teeth with a nail-studded toothbrush. And then wondering why on earth your teeth are falling out, and your dental bill is through the roof. Errr…what about my studded bicycle tires? There’s absolutely no reason for studded tires in Portland in the first place. It “snows” (if you want to call what happens here “snow”) like two days a year, in the worst cases. There’s absolutely no reason at all to allow Portlanders (and those coming to our fair city from outside of Portland) to run with studs for six months out of the year. As someone who grew up in northern Minnesota, I was shocked when I first moved to Portland and saw (or rather, heard) so many cars running studded tires in the city. In Minnesota, there is snow and ice nonstop for months at a time as compared to a few days per year in Portland, and yet drivers seem to do fine without studs there. There is a season running from roughly mid-november to mid-april that allows the use of studded tires in Oregon. Since studded tires can’t be easily installed or removed by a car owner, people who have to drive over mountain passes frequently for work and play, and live in valley cities (etc. ), tend to leave them on for the season. There would be no feasible way to ban them in the city without making them illegal in the state. You can’t expect someone to stop at the county line in the middle of a downpour at 6:30pm in the pitch black in december to swap out their tires on the side of the road…for the non-studdless tires they would also have to be carrying with them. I’m all for taxing the sale of metal studded tires for the sole purpose of road repairs. You pay for your damage and the convenience of not having to constantly install and remove destructive traction devices. There are plenty of good snow and ice tires that don’t have metal studs, but they tend to be more expensive, and wear out fast due to their softer rubber compound. I could see people choosing these more often if a metal stud-tax were to start to become cost-prohibitive. 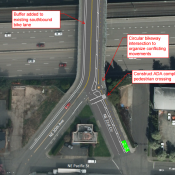 jackattack: there’s really no connection between the use of studs within Portland and the road conditions within Portland. People don’t put their studs on for Portland streets, they put them on for driving conditions in the cascades and leave them because they’re virtually impossible to swap out on the fly once you return to the city. I agree that studded tires should be banned in Oregon in lieu of other traction devices when whether conditions call for it. The rutting and other damage caused by studs makes it less safe for the same drivers who use them. I think taxing the sale of studs is my preferred alternative if an all out ban is not persued. Having investigated hundreds of motor vehicle accidents in Central and Eastern Oregon, I can say from experience and research that there is only a small number of days when studs on cars are actually needed anywhere. That is when the road surface is similar to a hockey rink. Apart from Klamath County, the opportunities to get the best return on studs is extremely limited. On snow and slush they offer nothing. Worse, they provide drivers with a false sense of superiority over the elemnets. When the ice is that bad, one should consider staying home to mitigate the risk of an accident or injury. “Just as good on ice”? What expert makes that claim? Any experienced snow driver can tell you otherwise–studs or chains offer remarkable traction on ice or snowpack. Snow tires aren’t nearly as effective without studs. Personally, I leave my car with studs in the driveway, as I bike and skate about town. I agree that I don’t need them around Corvallis; like so many BikePortland readers, I don’t need a car to get around, let alone one equipped for winter conditions. When I do use the car, it’s to get out of town, ideally with my family and my snowboard. Because I don’t want to end up under a snowplow or in the Santiam River, I use studs. Since I also hear that tell-tale crunching as I ride about town, I realize not everyone limits their stud use to appropriate times–I even noticed a police cruiser grinding down the pavement the other day. I’d gladly pay for a permit for the privilege of driving with studs. I don’t want the commons unfairly burdened by my use, and, more selfishly, I want the roads to be smooth and skatable. If there is to be any movement toward dealing with this issue, I hope people will focus on the idea of a fee rather than a ban. A fee system would encourage people to ask themselves whether they really need studs, while allowing folks to use them where necessary. To make things worse for the folks in Portland using studded tires (at least metal studded), stopping distance with studded tires on wet and dry roads is actually LONGER than non-studded tires. So they drive 99% of their winter miles in PDX where studs make them LESS safe, and 1% (or less) going skiing where studs may help, IF the pavement is actually iced over. I would love to see the idea gain traction (!) of capturing revenue from studded tire users. Good on ‘ya, Jeff. One other thing to think about: Portland gets thousands of vehicles a day from Clark County. It would be difficult to tax or assign a fee to those drivers, who are already not paying a porportional amount into the maintenance of Portland’s streets and roads. I doubt you’d be able to put a ban on studded tires on a per-region basis. My hunch is that it would be challenged in court. I would love to see them go. As stated elsewhere, the hearsay is that proper winter tires are as if not more effective than studs. An added annoyance of studded tires: the thermoplastic used for crosswalk markings have to be frequently relaid. Unfortunately PBOT does not strip the rest of the remaining thermoplastic before putting a new one over it, building up its thickness in the bike zone 1/8″ at a time. 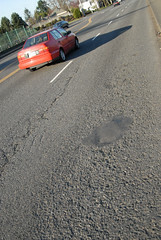 Some crosswalks become harsh speed bumps on the bike (westbound Broadway approaching the bridge). Regarding studs on bicycles: A physicist or an engineer would be able to refute or corroborate this, but my guess is that it’s more pound/square inch of pressure exerted by a bike upon the road, however it’s a much, much smaller contact patch. Cars kill the pavement through volume (both in terms of number of cars and in total square inches). Also, bicycle owners in general (especially those using the studs) are capable of swapping out their own tires and ride on them only when they’re needed. (I’ve only used mine for four days total in the last two years). I’ve never seen (or heard) a bicyclist running studs on dry or wet pavement. I say make it Illegal. I have studless snow tires and can travel through snow with ease and can out brake the same car with studs. There are other options out there. Germany has some beautiful roads and they outlaw studded tires for a good reason. I’m loving this thread here because participants actually know what they are talking about. Great points about actual stopping distance decreased on dry/ wet roads with studs, and the fact that if Minnesnowta can do without, we should too. And to the person who mentioned their studded bike tires, I wouldn’t worry about it unless you weigh over a ton. Actually, one could make a case that studded tires hurt automobile facilities while leaving the cyclable part of most roads intact. Studs are part of the reason that many Interstates in the northwest are veritable life-size slot car tracks, with twin grooves in some lanes that stretch for miles. I can avoid the rutted parts of most roads that I cycle–I can’t avoid many of those areas when driving. Learn how to drive in snow and ice and you will almost never need either. Maybe the legislation should consider using studs in order to get the desired traction? Just kidding. As a former Michigander (from the lower peninsula, where studs and chains are outlawed), I’m often amused by single-occupant SUVs being driven around the suburbs of PDX on warm sunny days. Remember though, that if the cars on the roads are in unsafe conditions, you and I being vulnerable users are also subject to the unsafe conditions if those slotcar tracks cause a motor vehicle accident, wiping us out. Yes studs are banned in Wisconsin, but Wisconsin does something that Oregon doesn’t, they salt their roads when it snows. This provides clear roads for winter travel and removes the need for studs. In exchange for clear roads Wisconsin gets to do irreparable harm to the environment though the leaching of the salt into the ground. nearly as effective without studs. and everywhere was a 40 mile drive. I ski almost every weekend – all winter long, since 1998 here in Oregon. tires for the last 4 years. safely navigated with studless traction tires. stubbornly attached to 50 year old technology. it is not legally a traction tire. Another option to chains and studs – is “snow socks” or “tire socks”. on and take off, and do not damage roads at all. Studs are outdated technology with no place in this world anymore. studded tires so it still wouldn’t cover the costs. The ruts in the road surface caused by studded tires fill with standing water when it rains and increase the risk of hydroplaning for all motorists. For this and other reasons already mentioned, if you actually did a cost – benefit analysis on use of studded tires, I’m sure they would fail miserably. @Dave #22 – ride on N. Denver and the bike lane is actually positioned right in the rut created by studded tires. I’m surprised no one has yet mentioned the corporate opposition to such a ban. We are seriously mucking with the profit margins of tire & rubber manufacturers and in the end, big oil. My understanding is Les Schwab is the biggest obstacle to such a ban, which is why a ballot initiative makes a lot of sense. The legislature wouldn’t touch a ban that carries such a big money political risk. I believe the equation for damage to a roadway is on the order of axle weight to the third power. This is a greatly simplified model, but it should give the impresstion that trucks to almost all the damage, and bikes almost zero. I’m not for studs, but I would be careful about saying that those who use them should pay. This very easily could be turned around on those of us who bike as we use the road, so we should have to share the cost by road taxes on bike purchases or licensing. How about a progression from permitting to banning. Start with a permit process that reviews the mileage of the car when the studs go on the car and then if you drive under a determined amount of miles then you could get a partial refund on the permit… that number could go down annually and then we would be ready for an all out ban. Studded tires = more damage. So they should should either cost more up front and part of the money goes to paying for future road repair OR a permit should be required. 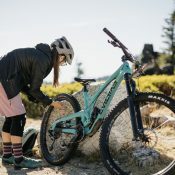 An all out ban is not friendly to Oregonians in the mountains. Apparently, in WA, basic snow tires and mud and snow tires do count as “traction tires” for the purpose of avoiding chain laws. I think the state is partly to blame. They are very fast to go to “chains required unless you have snowflake tires.” Sometimes conditions are easily traversed by 2wd cars still. Heck… Burnside and Cornell are snow zones, as is US 26. So if you don’t have a snowflake tire, they can require you to use chains. Studded snow tires happen to be the cheapest option for snowflake tires. Which is unfortunate, since they are much less safe from the wet braking standpoint. The noise also drives my dog nuts. I can’t wait for April, dog walks will be much nicer! I read something a while back on another site, part of the objection in Eastern Oregon is the cost differential between studded tires and studless snow tires. It can be about $50/ tire. Well, ValkRaider, I’m glad you deigned to enrich me, to lift me from my sad, stubborn, uneducated state. Tone aside, I truly appreciate your advice. I have a similar background, having spent much of my adult life living in the Utah mountains. However, I’ve been in the desert for more than a decade, and I wasn’t aware of the major changes in technology. When I last bought snow tires in Utah, they were just as you described. I also got around without studs; I carried chains for the worst conditions. I just moved to Oregon last fall. When I went to buy snow tires to head up to Hoodoo, Les Schwab had just one type, with or without studs. They aren’t traction tires, just snows. The sales staff wasn’t educating anyone on the options. I opted for studs for the first time because I have a young daughter, which makes me much more risk averse than I used to be. While I used to use chains (and I even carry them with the studded tires), I liked the idea that I would be ready for the first icy corner, and I wouldn’t have to park on the side of a sketchy road to chain up. Knowing what I know now, I would seek out traction tires and avoid damaging the roads. Even if we pay for the damage through permits, it’s still a big waste of petroleum to use up all that asphalt. Given an acceptable substitute, I’ll gladly give up the studs. A campgaign to ban studs should include an educational component, one which highlights the studies. Otherwise, the only information out there is from marketing and sales people. Oh, and Valkraider. Now, does anyone out there need $500 worth of studded snows, with just one trip over Santiam Pass on them? I think this story fails to mention the major reason people in the Willamette valley use snow tires. I grew up in Wisconsin and even had jobs that saw me driving 8-12 hour shifts through the winter. No studs, no problem. We banned them because they made our roads– already battered by ice expansion, salt and plows– even worse. Last time the big snows hit Portland (December 2008, I believe), I kept my truck off the road. There were so many inexperienced idiots out there to risk an accident. I fully believe that few, if any Oregon residents actually need snow tires. I have little sympathy for the folks who built their castles on slide-prone, impossibly perched West Hills lots. Live and learn! Fine, let’s phrase it the right way then. It’s not a fee to pay for the use of the roads, it’s a fee to pay for the amount of damage you do to the roads. I’d be perfectly willing to pay a commensurate damage fee for what I do with my bike to the road as to what a car or truck with studs does to the road. What would our cycling damage be, John? Like .50¢ a year (if that)? Count me in! I mentioned the “studs destroy roads” thing once upon a time to an actual pavement engineer, and he claimed it’s a myth – they do wear the surface, but the damage pales compared to the impact of heavy truck traffic. He claimed most of the wear (especially rutting) is due to compression of the road surface and base rather than abrasion, and that compared to 100psi truck tires with 20+ tons of freight riding over them, 2 ton passenger cars with 35psi tires are just background noise. So how does that traffic engineer explain why HWY 26 (prior to repaving) to Mount Hood had deeper grooves than I-84 which is the major truck route? Studded tires? No. 1 reason that the Portland area has the shittiest roads in the nation when compared to other temperate climates. That saves the rural areas from the ban, and the wear and tear in rural areas is much less because the miles driven per miles of road ratio is much less. The real damage is in the Portland area, so there should be a localized solution. Whatever the impact of studded tires, fees to use them, fines if you use them out of season or outright bans will change nothing about bicycle infrastructure funding. If such a ban or fee system were achieved, the only outcome would be seen as more revenue and lower costs. Others have made a valid point on the politics of this. I admire Mr. Bernards’s optimism that such an effort by the cycling community would yield positive results, but I don’t see anything in the current debate about bicycle funding, not to mention any sort of state-wide funding, that leads me to believe it would happen. I wish it were otherwise, but I don’t think it will be so. “Studs destroy roads” [is] a myth – they do wear the surface, but the damage pales compared to the impact of heavy truck traffic. Seems plausible and I don’t have facts to deny it. But the engineer did also admit that the studs abrade the surface. All that line retouching has costs; both the dollars that it takes, and those damned bicycle hazards from built up thermoplastic layers on crosswalks. Plus, anecdotally: I’ve never experienced roads in the bay area of California (where I grew up and where studs are nearly unheard of) with the troughs in them like I do around Portland. Even out of the Portland Metro along I-5, the troughs are lesser on southern I-5 than they are on northern I-5. So, either the roads are engineered better in California; or Oregon has a worse track record of repairing roads; or the studs to more damage than the engineer was aware of or admits to. There’s certainly more freight traffic around San Jose, Oakland and San Francisco than in Portland and none of those cities have the troughs in their roads that Portland does. We should ban studded tires and start salting the roads instead. I heard it is good for roadside vegetation and run-off. I don’t buy that they can’t regulate the use of studded tires from region to region. They do just that with DEQ . Some of the outer counties do not have to comply with the same emissions standards that Mult. Clack. and Wash. counties do and yet they are able to regulate that to an acceptable extent even without the need of those municipal stickers or county of residence on the license plate. In most states with snow the winter temps stay low enough to keep the humidity down. Here in Western Oregon where the winter temps hoer just above freezing, the prevalence of black ice is extremely high. I live on a hill with a 16% grade. Try navigating that with black ice on the roads-without a traction device. I do have a vehicle with a studless winter tire and I’ve used studless winter tires for about 15 years. They do not work as well as studs on ice, nothing does. There are “green” studs available in Europe that extend above the tire surface when it’s just above freezing and retract as the temps climb….too bad they’re not available here. Maybe someday. I’m not opposed to a fee…even a high one, but my safety and the safety of those who travel in my vehicles comes first-above road damage. This is one of those- don’t criticize me when you haven’t walked in my shoes, driven on my tires, ridden on my wheels kinds of debates. Flame away if you choose to. Im in EMS and Search and Rescue and have seen and lived to deal with the human carnage that results from lack of traction for cars, motorcyles and bicycles. More on the issue from Washington State. Studded tires should only be sold pre-mounted and balanced on a set of new steel rims. That way, a customer can return to a tire shop and have his normal non-studded tires put on his car when the weather doesn’t call for studs. Wear on studded tires and the cost for continuous remounting and rebalancing is saved. Most tires shops will put on a set of pre-mounted rims and tires for free, as it is quick and easy. But all will charge for mounting and balancing tires that are not already mounted on rims. I agree with those who say that metal studded tires do substantial damage to the roads. I’d love to see an estimate from ODOT. I believe that this is best addressed at the state level rather than with a patchwork of local ordinances that vary from jurisdiction to jurisdiction. We have family in Central Oregon so we go there a lot in all conditions without trouble. We don’t use metal studs – they are no longer necessary as there are lots of good alternatives now that don’t gouge the roads so badly. I’ve long thought a zip code based surcharge on studded tires would be a good way to minimize their overuse in Portland, etc. For residents of the Wallowas, Bend or Govy, etc., the fee is minimal. For Willamette Valley residents, I’m thinking $100 a tire will make anybody think twice about getting studs. That way you can give the “not-Portland” part of the state a good way to stick it to us, and reduce studded tire use where it’s the least needed and most destructive. Dave your statement is just plain wrong, studs do much more damage than regular road traffic, truck or not. Those troughs you see in the roadway in and around Portland are due to the heavy stud useage in the area. This part of the country is almost unique in having this type of damage. Even on the east coast, the roads are in much better shape, because they salt the roads, therefore studded are not used even though they are allowed. It really is night and day. You have to leave this area and look at other northern states to see how much they damage the roadways. im glad this is being brought up. I think if more people understood these issues people would use them less. Thanks for brining it up! For those who argue that (most) people who run studs run them because they frequently travel through dangerous areas, I must disagree. I know dozens of people who damage our roads with studs each winter, who never go anywhere near the mountains. Maybe 1 person who actually travels reguarly into areas where they are necessary. They just buy them because they can’t bear the idea of even one day of not being able to drive their car, and refer to it as “being prepared.” In reality they go through entire winters running on them and never needing them. And then to make it even more frustrating, I know many of these people who have then decided they were too scared to drive on the 1 or 2 days that they could actually make use them, making further useless the damage that they are causing to the roads. These people need to be taxed. I use studs. I have lived in Minnesota and Vermont, I never used studs in either of those places, snow is a lot easy to drive on. Those states both salted their roads when it got icy. Driving on snow is not the problem. On a clear day, when the temperature drops below freezing, sections of I84 close to the warm Columbia River get very icy but only in the shadows and is very dangerous. I have tried other tires and in my opinion they don’t work as well. All the information I have seen says studded tires *are* more dangerous but only because people drive faster with them. Road Damage….probably some but compare a studded car to 18 wheelers with CHAINS on….The fact is, studded tires don’t help much on snow..maybe not at all…but on black ice….I want studded tires. If Portland doesn’t want to use studs that is fine by me..parts of this State get some very dangerous black ice and it is impossible to know it is there until it is too late.